And now for the 23rd yacht sold in 2012 so far as Burgess tells me that their central listing, the 37.5m motor yacht Muse is now sold with Wes Sanford at Northrop & Johnson representing the buyer. Muse is the second hull in Palmer Johnson’s 123? series and was delivered in 2006. Exterior styling is by Nuvolari Lenard who were also responsible for her interior design which uses walnut and sycamore panelling along with materials in neutral browns, beiges, greys and blues to create an atmosphere of elegant harmony and relaxation. RINA classed and MCA compliant, Muse accommodates eight guests in a master, VIP and two double cabins, all fitted to the highest standards. Twin 2750hp MTU engines give her a range of 1,000 nautical miles at her cruising speed of 14 knots. 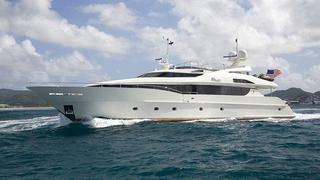 The seller was a two yacht owner and Muse was asking $8,450.000.